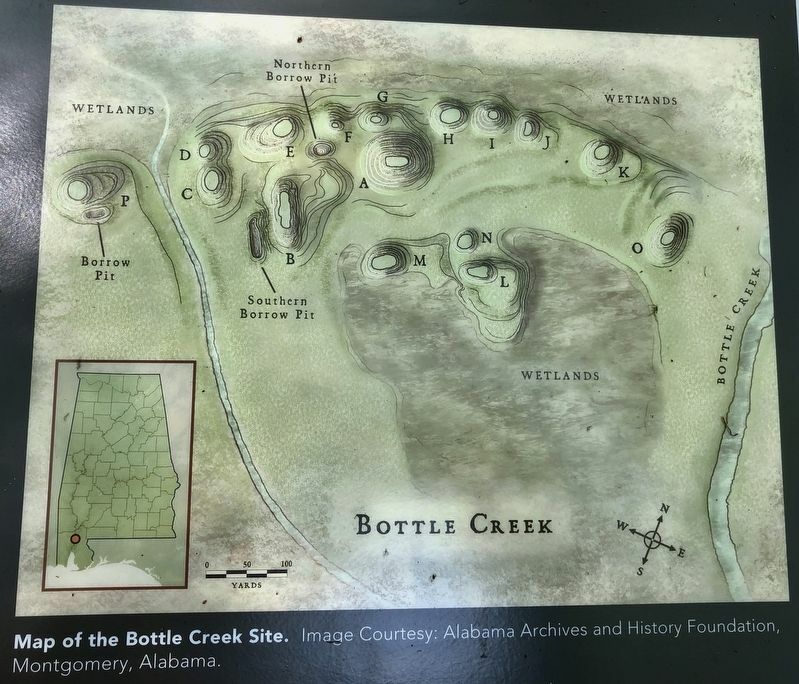 The Bottle Creek site is the second largest mound center in Alabama and it represents the remnants of a large Mississippian Stage civic and ceremonial complex that dominated the Mobile-Tensaw Delta from AD 1250 to 1500. Located in the heart of the Delta approximately twenty miles from here, Bottle Creek included eighteen mounds along with canals and residential areas that covered much of the northern end of Mound Island. The people who built the mounds here left behind artifacts that show a clear cultural connection to the massive mound complex of Moundville to the north and to the peoples of the Lower Mississippi River Valley to the west. The people who occupied Bottle Creek were connected to other peoples throughout the region, trading in goods, materials, and ideas that helped build a thriving culture. They brought fish and shellfish from the coast to the south, stones for making tools, ornaments, and ceremonial items from the lands to the north, and pottery styles from across the Gulf region and beyond. 2. The Bottle Creek Site Marker on right. The Tensaw River can be seen in far background. is an Alabama Historical Commission property. 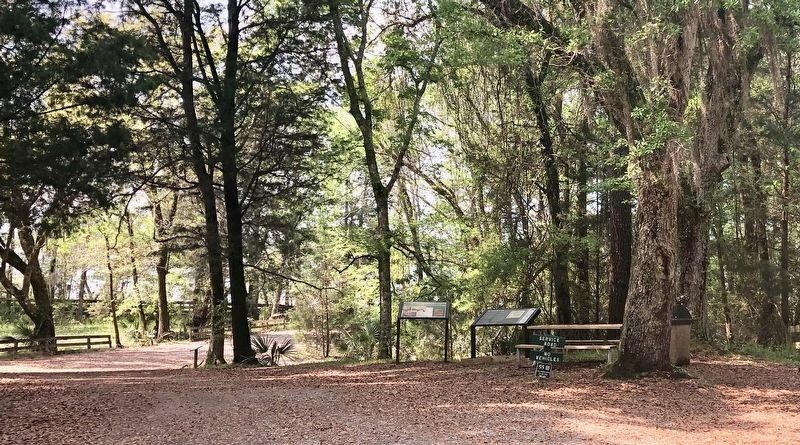 This site is very important to numerous Southeastern indigenous tribes who assert an ancestral connection with those who built and occupied Alabama's ancient mounds. The earthwork landscapes and the objects and information recovered from them reveal a rich cultural tradition that still thrives today among these tribes. Our indigenous mound sites represent a heritage for all Alabamians to cherish, and it is important that we protect and preserve them for future generations. Erected 2019 by the University of Alabama, the Alabama Bicentennial Commission & the Alabama Association of RC&D Councils. Location. 30° 44.851′ N, 87° 55.409′ W. Marker is in Blakeley, Alabama, in Baldwin County. Marker is on Franklin Street 0.4 miles north of Washington Avenue, on the right when traveling west. Touch for map. Marker located in Historic Blakeley State Park. Marker is at or near this postal address: Franklin Street, Spanish Fort AL 36527, United States of America. Touch for directions. Other nearby markers. At least 8 other markers are within walking distance of this marker. The Apalachee Village (here, next to this marker); The Town of Blakeley (approx. ¼ mile away); Site of Baldwin County's First Courthouse (approx. ¼ mile away); Redoubt Six (approx. 3. Closeup of mound map on marker. 0.6 miles away); Battle of Blakeley (approx. 0.6 miles away); Alabama (approx. 0.6 miles away); Fort Blakeley (Fort Blakely*) (approx. ¾ mile away); The Battle of Fort Blakeley (approx. ¾ mile away). Touch for a list and map of all markers in Blakeley. More about this marker. Bottle Creek Indian Mounds are located on Mound Island, about 17.3 miles north as the crow flies. 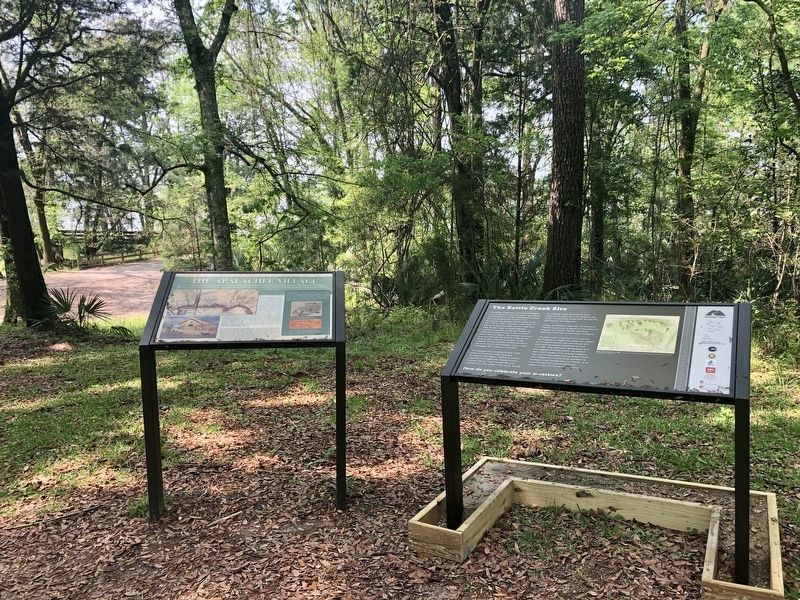 Due to the remote location of the mounds site, this interpretive marker has been placed here to be accessible. PLEASE NOTE: Individual visits to Bottle Creek are not recommended due to the threat of wild animals and the protection of this historic site. If you do visit, please remember to "Leave No Trace". 4. Another marker about nearby Indian village. More. Search the internet for The Bottle Creek Site. Credits. This page was last revised on April 7, 2019. This page originally submitted on April 7, 2019, by Mark Hilton of Montgomery, Alabama. This page has been viewed 51 times since then. Photos: 1, 2, 3, 4. submitted on April 7, 2019, by Mark Hilton of Montgomery, Alabama.